If you are going to be using a credit card to make purchases, it’s a no-brainer that you’ll want to earn some kind of reward in return. For many people, the obvious choice is an travel rewards credit card. Unfortunately that credit card choice may actually be costing them more money to use. People are just too excited by the allure of ‘free’ flights that they overlook how their credit card is creating higher expenses. 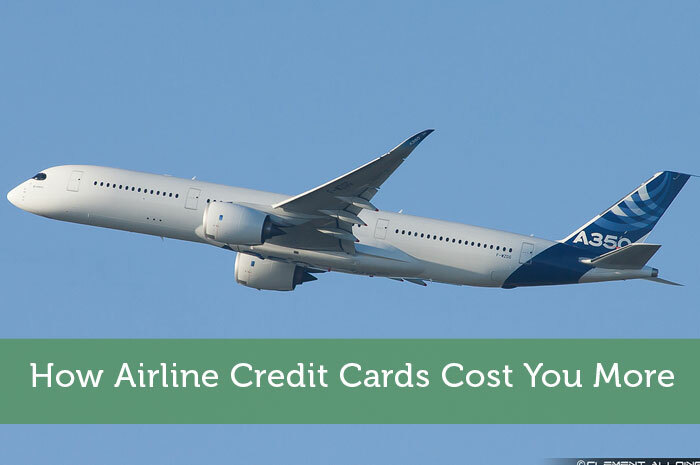 Let’s look at some of the ways that an airline credit card costs you more. The biggest way that an airline miles credit card costs you more money is the increased frequency of taking vacations. Previously you may have taken a big vacation every 2 or 3 years. When you know your credit card purchases are helping with the price of the flight, you might increase that to an annual vacation. The problem is that the plane ticket is only part of your vacation expenses. Don’t forget how much everything else adds up…hotels, car rentals, dining, entertainment, souvenirs and sometimes even extra time off work. Plus you may go on vacation before the points cover the full price of the flight. I felt the true brunt of this a few years ago. As a performance bonus at my job, my boss gave me and my girlfriend round trip tickets to wherever I wanted to go. We chose Australia and it ended up being an awesome trip. Still, it turned out to be a fairly expensive vacation even though our airfare was covered. We spent a lot of money and my online business was essentially put on hold for 2 weeks. We also used up vacation time at work that we would’ve probably cashed out at the end of the year instead. With airline credit cards, people tell themselves that they’ve earned the vacation since they racked up so many miles. What a convenient excuse to spend more than necessary. It’s like justifying any other expensive purchase just because it’s on sale. While more and more credit cards have no annual fees these days, airline credit cards are one exception. It is rare to find an airline miles credit card that doesn’t come with an annual fee. The more attractive the rewards program, the higher the annual fee. Several of the better cards charge upwards of $400 annually. That’s a lot of money! Since the potential rewards calculation can be quite tricky, some people go with one of these cards just assuming that the high annual fee is worthwhile. That’s not always the case though. You have to charge a significant amount each year to offset that fee. The few airline cards that don’t have an annual fee tend to earn mileage at a very slow pace. With those cards you also have to watch out for various travel restrictions such as blackout dates, limited ‘unpaid’ tickets per flight, few airlines to choose from and unexpected redemption fees. Also, your points may eventually expire if you don’t use them in time. Even when paying an annual fee you may not be immune to some of these limitations. If you are a responsible cardholder, you make a point of paying off your credit card balance in full each month. This is normally quite easy to manage when you aren’t using your card frequently. What happens when you are suddenly putting every possible expense on your credit card? Can you maintain that same level of commitment when you start getting 4 figure credit card bills? With that high balance and high interest rates, carrying over a balance results in a hefty interest charge. Some people may be especially excited about future free flights, to the extent that they use it as an excuse to spend even more than normal. They may justify that it is time to replace that couch since they’d be earning miles now. Maybe they’d cover the dinner bill when out with friends knowing full well that not everyone will remember to pay them back. Just the thought of that upcoming vacation may cloud their judgement. I’m not saying that everyone gets the short end of the stick with airline credit cards. It is just very common to get less benefit than you had anticipated. You just have to decide if your spending and travel habits truly make it worthwhile. If you’re unsure, it might be better off to just keep it simple and opt for a cash back card instead. Do any of you currently use an airline credit card? Is it costing you more money in any way? Or if you chose to avoid airline credit cards, what was your reasoning? Gilead Sciences Is a Value Buy or a Trap? Jeremy Biberdorf is the founder of Modest Money. After working many years in the website marketing industry, he decided to take on blogging full time and also get his finances headed in the right direction. I just stick with regular rewards credit cards for this exact reason!!! I don’t like earning “miles” for some reason, just cash back! I like how you put miles in quotes. I should’ve mentioned something about that in the post. Sure all the rewards program calls them miles, but they’re really just points and they have their own calculation for what that actually gets you. Cash back is just so much easier and it doesn’t force you to spend extra. We use a travel points card but it only works in our favour. We have to travel 2-3 times a year so the savings on the flights really helps. Plus, we pay it off in full every month and only use it to pay for bills we would have regardless. It works out really well. I knew there would be some people commenting who have benefited a lot from airline credit cards. People who have to travel a lot anyway would be the main group. You can often get higher rate of points accumulation when using the card on travel related purchases too. I don’t have any airline cards but I know a few people that do and get a few free tickets from Southwest on an annual basis. I don’t know why I’ve avoided them…I guess I’ve just avoided all credit cards in general. We have 2 as of this moment but don’t use them. I’m going to be looking to get one for my business expenses here soon but I think I’ll go for a cash back program as opposed to airline miles. Sure they get a few free tickets each year, but how much extra does that lead them to spend each year? I guess if travel is a big priority for them, it might work out. I think once you get a cash back credit card, your view on credit cards will change. You’ll realize that by paying with cash you are voluntarily paying 1-2% higher. I’m sure you’ll eventually want to put more and more of your regular expenses on a cash back card. I don’t have a flights rewards card right now but we are considering one for the sign-up bonus. We fly several times per year for obligation travel anyway, so getting maybe one flight for free would be a great relief and wouldn’t increase our spending. If we get the new card the plan is to get the annual fee waived in the second year or cancel the card, and of course we never carry a balance. In general though, we prefer cash rewards cards. That obligatory travel is a good reason to get an airline credit card. They do have attractive rewards for people who won’t just use them to take unnecessary vacations. They may very well waive that annual fee if you threaten to cancel the card. I recommend looking for one that gives you bonus points for travel purchases. I knew you’d be one of the ones arguing in favor of these kinds of credit cards Sean. When travel really is a major priority in your life, an airline credit card makes a lot of sense. You just have to make sure that you still do what you can to avoid any interest charges. I just choose to get regular credit card rewards for a lot of points you make here. I’d rather take the cash back or gift certificates than earn miles. My roommate travels a lot and loves to get miles – and maybe one day if I travel a lot, I’ll do it also but until then, I’m happy getting gift cards to Amazon! Sounds like you are making the right move choosing the rewards that works best for you. Just be careful that those gift cards aren’t leading you to spend more too. I think they have the propensity to make people think they *can* travel more, but there are a lot of people who *do* travel frequently for work. I know someone who travels weekly and sometimes twice in the same week. He’s hardly ever home! He has to have all the frequent flyer cards and credit cards, and it works out to his and his company’s benefit. I should’ve mentioned how useful those cards are for people who are already frequent travelers. Those are the people who would get a ton of benefit from an airline miles credit card. Having to travel once or twice a week makes it so that they shouldn’t be considering any other kind of credit card. I’d totally get one if it didn’t have the fees. Even though I’d be going on more vacations spending more money on the ground, if it balanced out because I was saving on airfare that sounds like a great plan to me! I guess it also depends on your current financial situation and long term goals. If you can afford to travel lots and just want to save money, I figure why not. I just personally can’t afford to travel much with my current financial goals. Thankfully I don’t chase the miles, or points. Sounds good to me, but I would at least make sure to earn cash back rebates on your purchases. You can get that without an annual fee or without the need to really chase anything. Interesting comparison to time shares. With both you do have somewhat of an obligation to spend money on regular vacations. $1000 cash back is an impressive figure. I’d be interested to know what cash back percentage you receive to reach that. I signed up for mine initially for the bonus “miles” and saved about $500 on a vacation right away (in 2011). We have also saved enough miles for a wedding we’re attending in November, so that saves another $800 or so. We do pay the $75 annual fee, but so far we’re coming out ahead. We also get a “2nd passenger flies for $99” voucher each year, no matter the cost of the first ticket, which is cool. This is in addition to the miles. I may be looking for another card soon, if we decide to not travel as much. I can see how it encourages more travel, but we budget for a small vacation each year, and having the card allows us to go further, instead of staying in-state for our vacation. Also, I have family in other states, so it’s great ot be able to hop a plane and stay with them (low cost) and not pay $600+ for a trip. For now, it’s working out, but I still want to keep on the lookout for something that might be a better deal. I like the feature you mentioned about the 2nd passenger flying for $99 once each year. For someone who is careful with their money and does annual flying anyway, I think you’re making the right move with that card. That’s a good idea to keep your eye out for better cards though. Lots of cards do come with great welcome bonuses for new members. When you are calculating whether you come out ahead or not, you should be comparing to what you could get if you had instead used a cash back card. I’d be careful about hopping from credit card to credit card. That could have a negative effect on your credit. I should probably try to confirm that since there is a credit card that I want to switch to, but am wary of having too many cards. You definitely have to be careful but most of these downfalls can be avoided by knowing you agreements and good planning. It is good to put them out there so people can see if they are commiting these mistakes. For sure, it is all in the cardholder’s hands in the end. In my opinion it all comes down to the person’s financial and travel habits. An airline credit card can actually be one of the better deals out there if you do use it responsibly and can actually afford regular vacations. If you only use the card for gift cards, I’d look into what rebate percentage that works out. I don’t know for sure, but I’d think those would work out to be less than what you’d get with a straight up cash back credit card. Plus you can’t lose those rebates since they are usually automated. I prefer my cashback credit cards, though I do also have a SCENE Visa which gives me free movies which is nice though I think you’ve got to spend about $1000 to get one free movie. So far my BF has the MBNA Mastercard and he’s gotten about $100 cash back in the past year, it’s pretty great. I’d probably avoid using the Scene card unless your cash back card only gives 1% cash back. I just looked up that MBNA card and it sounds pretty solid. I may have to apply for that one soon, although I might be starting to collect too many credit cards. Unfortunately the one that I’d most want to close is the one that allows my bank to waive my checking account fees. I do have one – the annual fee was not too high last year, and was rebated completely this year. That being said – I’m not planning to travel much, so next year I want to switch to a cash back card! Good to hear that you’re take into consideration your future travel plans with your card choice. That is where many people would run into problems. They wouldn’t be planning to travel and then they see their miles balance and change their mind. I agree a common problem with rewards and airmiles on credit cards is that they encourage you to spend on them! Since most people only check how much they’ve spent on their monthly statement, it’s very easy to overspend and start accumulating debt. This is especially true if people are not used to charging much to their credit card and then really increase the usage frequency. They might see all the cash in their bank account and forget that a lot of it will have to go to their credit card. I compared a lot of miles credit cards to regular rewards credit cards, and found that you had to spend wayyyyy more just to get the same amount of rewards for other credit cards. When researching credit cards, you should look at the overall benefits of the card and what you want out of it – protection, warranties, foreign transaction fees, insurance for travel, price-matching policies, etc as well as rewards system. Good point about the other features Erika. I know I am pretty guilty of looking exclusively at the rewards and the annual fee. Mostly that’s because I don’t use the extra features much at all. If you do though, you definitely need to take that all into consideration. The rewards is still usually the most important part for the average user. I have a regular cash back rewards card and a general travel rewards card. I don’t like the fact that your choices are limited with airline-specific cards. Right now I don’t travel too much so it works well for me. I think the problem with lack of choices is not as bad as it once was. It seems that a larger percentage of cards these days boast about having no blackout dates or seat restrictions. In the past it was just the norm to have those limitations. If you don’t travel much, you are best just sticking with a cash back credit card. I don’t use airline cards, but I am a fan of online airline mileage malls, which allow you to get miles by normal shopping. I’ve never been on a site that offered something like that. Sounds like an interesting concept. If I did more online shopping, I’d be definitely look into that. We don’t really have the credit yet to qualify for most rewards cards. My wife does have a Capital One card with “cash back” (although my understanding is that you don’t actually get money, you can redeem it for a gift card). Well work hard at improving your credit and the banks should be willing to give you a rewards card soon enough. Sometimes the cash back cards that give gift cards work out well if you regularly shop from those stores anyway. And yeah, family visits usually are reasonably priced once you get there since they are quite willing to cook you up some good meals. Also you end up spending most of the time just visiting rather than feeling the need to go out and spend a bunch of money on entertainment. I refuse to pay a monthly charge for a credit card, so sadly no airline card for me. I have the Scene VISA and love it! I’d actually look into some other credit cards Brian. From what Jessica mentioned about that credit card above, it sounds like a pure cash back credit card may be better. I guess it depends on how much you go to the movies though. Did my last comment end up in your spam? I swear I left a comment yesterday on this post. Never mind. Sorry. My computer seems to have loading issues. They aren’t there at first and then they show up. Sorry I think you might be having problems with some caching options I had setup. They were supposed to improve the pagespeed of my blog, but if it’s messing up the user experience, I’ll have to try changing it. I do check my spam folder periodically and have yet to find any good comments there to restore. I think a lot of people struggle with these things when they have credit cards they use to earn airline miles. Exactly…and then you aren’t pressured into going on more vacations than you need to. If money is tight, you can just use that cash back for other purposes. You might still end up chasing cash back rebates a bit, but at least you won’t be in a situation where if you spend X number of dollars then you’d afford that flight you were planning. It sounds like work actually pays for most of your flights, but those points will come in handy for the conferences you plan on attending this year. It is especially good as my spouse has to stay in a hotel once per month (sometimes twice) and the payout is 4.5% when you use the TD expedia site! That’s smart to use the cash back card only at the places that give higher rebates and a travel rewards card elsewhere. I really should start doing that, but for simplicity I just use my cash back card everywhere possible. I don’t really like airline credit cards. It makes you go for an unplanned vacations because you’re confident that you have airline credit cards and you’re thinking that you get discounts. But at the end of the day, you’ll realize that you’re spending too much. Once you didn’t pay full payment, you’ll be charge of high interest rates and that’s not good. That’s why I keep on avoiding airline credit cards. If you’re planning for a vacation, save money for it. It’s surely better than using credit cards. The unplanned vacation angle is why I don’t use airline credit cards. Cash back is just such a simpler reward that doesn’t make me spend more. You’re right that some people do aggressively try to rack up airline miles to the point that they have to pay interest fees. We have the same insights about airline credit cards. Some people just get excited on unplanned vacation and never think about the interest fees if they didn’t be able to make a full-payment on their bill.